Netflix has denied altering a viewer’s experience depending on their race. It’s been accused of “misleading” black users by showing promotional shots of black cast members in films and TV shows – even if they had a minor role. Netfix told Newsbeat: “We don’t ask members for race, gender or ethnicity so cannot use this information to personalise their individual experience. Netflix’s statement came after the issue was first raised on social media. Using the promotional shot of two black actors for Like Father – which is made up of a mostly white cast with Kristen Bell as the lead – she added: “It’s weird to try to pass a film off as having a black principal cast… when it’s a white movie. Another example she posted on the thread included using a photo of Chiwetel Ejiofor and Keira Knightley to promote Love Actually. Some people said it was “misleading” and “messed up” but others said it was “just marketing“. 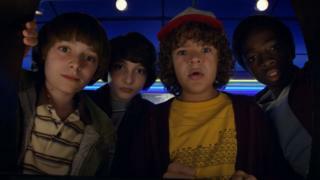 In a blog published last year, Netflix revealed it was launching artwork personalisation for its films and TV shows. It explained various promotional shots would be created for the shows and films and they would be linked to viewing history. In its statement to Newsbeat, the streaming site said that “reports that we look at demographics when personalising artwork are untrue”. It maintained the only information it uses is a person’s viewing history. “In terms of thumbnails, these do differ and regularly change. This is to ensure the images we show people are useful in deciding which shows to watch.